Saint Paul de Vence is a charming hilltop fortified village in Provence, filled with art galleries, boutiques and sidewalk cafes. It's hard to find something ugly about this quaint village. A walk through its winding streets reveals elegant fountains, vine-covered stone walls and statues tucked into the walls. There are breathtaking views of mountains and the Mediterranean sea, sparkling in the background. Even the cobblestones have beauty; they're shaped like flowers. The one downside to visiting Saint Paul is that you won't be alone. This is a bit of a tourist trap and can be overrun at times (300 people live within the fortified walls, but 2.5 million tourists visit annually). The other problem is that it isn't the easiest town to get to since it is not accessible by rail. But check out how to get there below which includes detailed explanations for accessing the village. If you don't have a rental car, the best way to reach Saint Paul de Vence from the major Riviera cities is by bus. From any Riviera city, take the train to Cagnes sur Mer. Exit the train station, turn right and follow the road for about a block or so. Do NOT stop at the bus stop you see on the right, but continue to the bus stop across the street on the left-hand side instead. The bus takes around 15 minutes, and goes straight to the entrance to Saint Paul's fortification. Alternately, if you are in Nice, take the TAM bus (ask anyone or visit the tourist office for directions to the proper bus stop, as there are several in Nice). You are looking for line 400 (not 410, which skips Saint Paul and goes directly to Vence), which states "NICE-VENCE-par St. Paul." It's about an hour bus ride. In all instances, you must use the bus to get there by public transport. It runs about every half-hour, with the fewest runs at lunchtime or on Sundays and holidays. The fortified village itself is a striking site, with its medieval fortress walls surrounding the city. The entrance was erected in the 1400s and features a canon muzzle that was a trophy from the 1544 Battle of Cerisoles in Italy. As you walk through the village, look up at the artwork embedded in the walls. This includes religious statues and various other adornments. Walk towards the south side of the village and climb the steps to the vue (view), which overlooks a gorgeous cemetery, surrounding hills, and mountains. You'll find the grave of Marc Chagall here; he was one of the many artists who made their home in this part of the world. At Bastion St Remy on the west side, you can glimpse the sea. From this hilltop eyrie you can see the snow-covered Alps to one side, and the glistening Mediterranean Sea in the other direction. You can hardly take a few steps in Saint Paul without tripping over an art gallery. As an artists' village, it's also the place for more affordable crafts. The costume jewelry on sale at many of the shops is affordable and unique. You'll also find Provencal fabrics on sale, as well as local gourmet delicacies like olive oils, wine, and fruit liquors. La Colombe d'Or is the best spot for art-lovers. This hotel and restaurant have played host to some of the hottest names in art: Picasso, Matisse, and Prevert among the list. You can view their works on display here. If you plan to dine here, make reservations before you go. Le Saint Paul is a four-star hotel with a beautiful terrace or inside dining rooms for meals from the Michelin-starred restaurant. Its 15 rooms and four suites are situated inside a 16th century home and decorated with Provencal furniture. 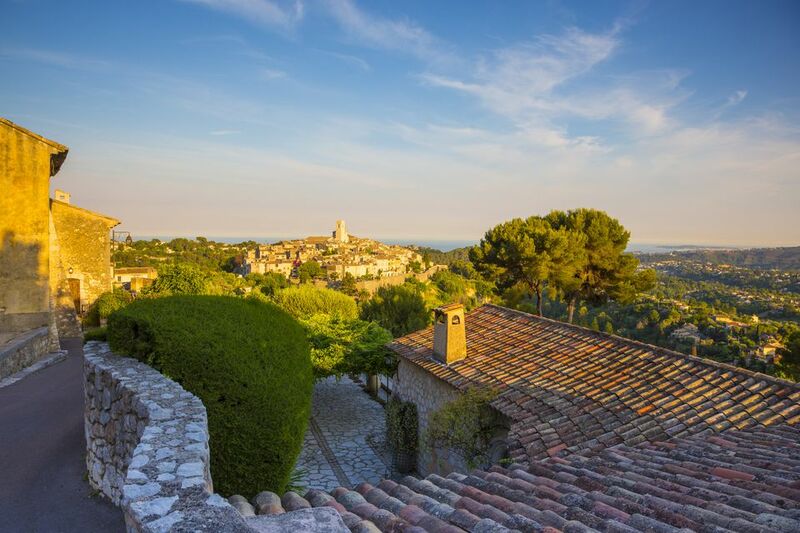 Read guest reviews, compare prices and book a hotel in St-Pau-de-Vence with TripAdvisor. A few minutes walk away you'll come to one of the great art galleries of the region, and of France as a whole. The Fondation Maeght has an astonishing collection of modern art housed in a purpose-built gallery where the architecture, the grounds, and the work were, literally, made for each other. If you use St-Paul as your base you'll find plenty to see in the surrounding countryside. You will need a car, but you can get the hire car company to deliver the car to you in St-Paul. Did you know there really is a village called St. Valentin?